As many of you know, Podium V2.6 was released to beta about a week ago. 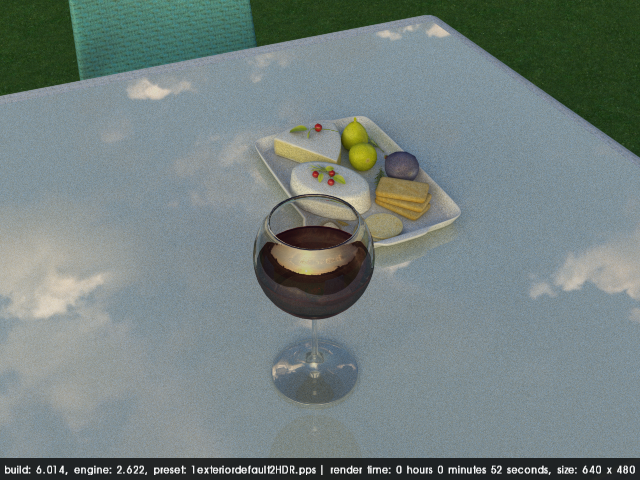 The major feature addition is image based lighting with HDR background images. Your V2.5 license cannot be used to activate the beta - V2.6 will be a paid upgrade when it hits commercial release. Further, Podium and Podium Browser have been combined under a single license in V2.6. Because of this, you will need a V2.6 license to activate the beta. If you are an unlicensed tester: V2.6 beta resets the trial date to 30 days and functions exactly like a fully licensed version of SU Podium. The only thing you won't have access to is Podium Browser. If you already own a Podium Browser license -- See below. Please include Podium Browser license key in the email, and we will send you a temporary V2.6 beta license. This is a temporary 30 day license and will stop functioning when V2.6 hits commercial release. Feel free to post any render tests, questions, bugs, feedback, etc. Thought it would be good to have a specific spot on the forums for people to send feedback or ask questions. Or as always, feel free to send them through email. Whatever you prefer! Known Bugs - I will continuously update this post if necessary. 1. "License is currently in use on another machine"
At render time Podium displays a "license is in use" message and then causes Podium to close. This only occurs in relatively narrow circumstances. It is limited to Windows only as far as we can see. The "license in use" message only appears after downloading a very large item from Podium Browser -- when an item takes longer than about 45-60 seconds the licensing server gets confused and thinks there are two instances of your license being used. So this is related to both connection speed and the size of the component being downloaded. Many of the Christmas living room assemblies have caused the bug, as well as some of the high-poly vehicle models. If you encounter the licensing bug - Close SketchUp and wait for 3-4 minutes. This gives the license checker enough time to "release" your license, and you should be able to continue rendering after that. In my own experience at least, this is not occurring frequently. Most "Regular sized" items like materials, furniture, appliances, decoration, etc. are working fine. Title says it all. Edit In Place is currently not working in V2.6 for Mac. We're looking into it. 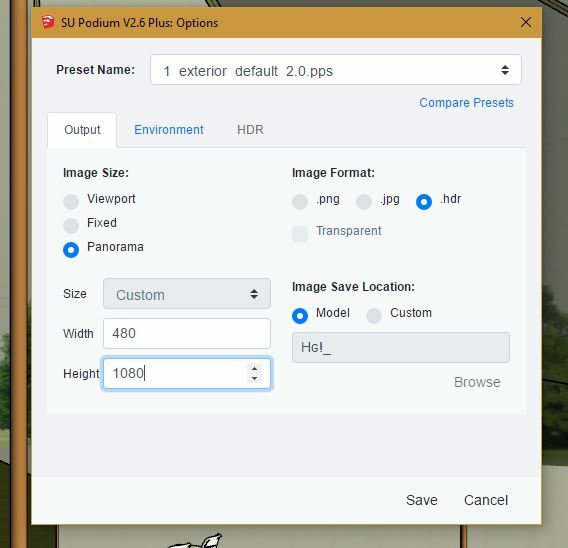 When selecting the panoramic option in V2.5, the resolution input fields auto-complete to a 2:1 aspect ratio after filling in the first value. (If you enter a width of 4000px, the height automatically becomes 2000px). This is not functioning in V2.6 beta. The workaround is to click the panorama radio button a second time after entering your first value. Or simply enter the values manually. PLACING THE 'SUN' IN IBL. 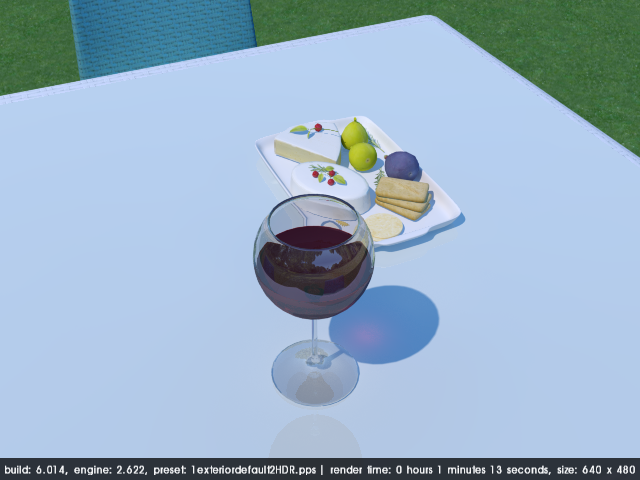 Since IBL doesn't use the sun or shadow settings of SU, there's no visible shadow in your SU scene, I do the next to get 'sun' of the HDRI in the place where I want it to be. When you saved your scene, rotate your view (and up) to where you want to be (expect) the 'sun'. Then go to the HDR tab of the Options view. Rotate the HDR till you see the sun straight at you. Push Save and click the scene again to restore your view. Q: I noticed that not all presets had a -2HDR setting. I suppose this will be with final release? Can I use the presets from V2.5? 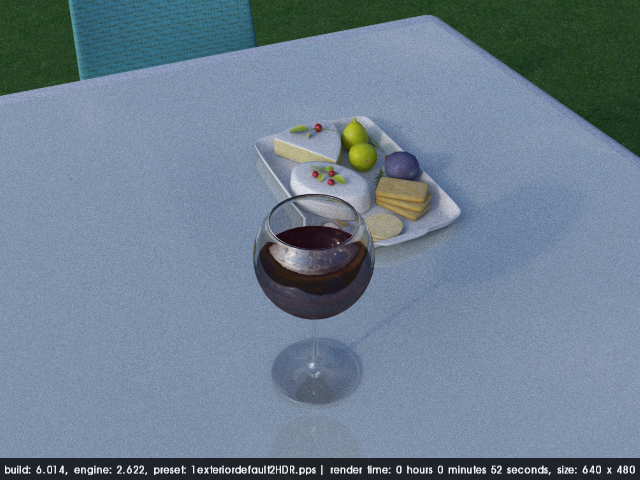 A while ago I build a model of a glass of wine to see if I could the translucent light right. With the new V2.6 it's nice to test it out. The first one is with Physicalsky2 and sun, a 360 background to get some nice reflections in the glass. Caustic and translucent color is on. the next are tests with only HDR backgrounds and different exposures. 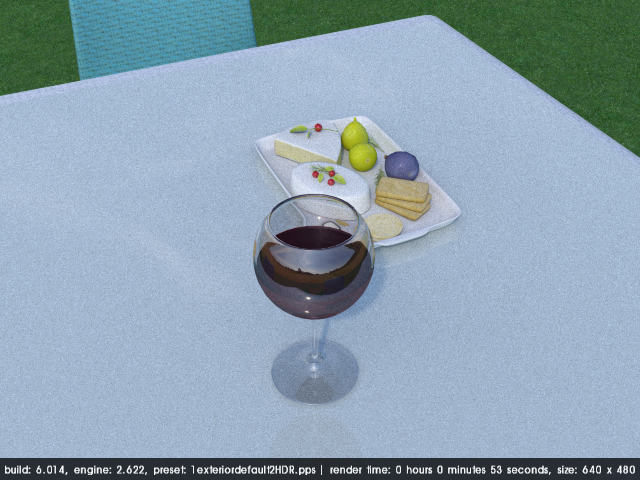 and final some more fun renders. This is confirmed on Mac also. Great catch - thanks! I get it why the Podium team made the Options 'acknowledge' button a Save (and close window) and not a OKE button. But users (like me, I like to keep it open...) will reopen the option window and then switch between scene's. They'll expect that the options will change with the scene's, but it won't. So perhaps a head ups in this case for the users? Ah yeah thanks for bringing this up -- now that I'm testing it, I agree it is not completely intuitive getting settings to save with each scene. And yeah, as you noticed the options dialog doesn't update dynamically when you switch between scenes. You do have to close and re-open before the values will change. 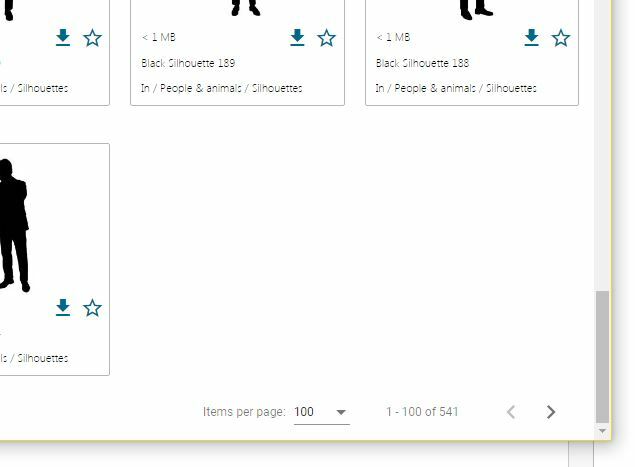 I'll write something up about this and add it to the beta page. Saving render data between scenes is a new feature. I'm not sure if there is a way to automatically read the scene data in the background, and push any updated values regarding scene changes to the dialog. 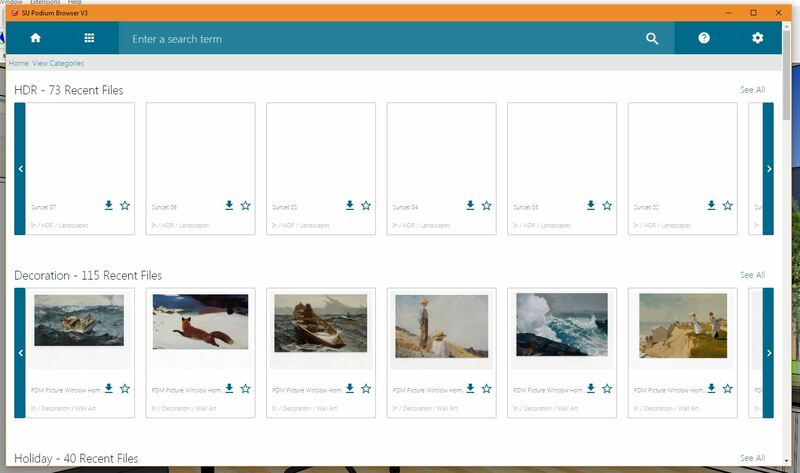 Podium Browser is not showing the HDR files. Are they still being uploaded? The V3 Browser has some problems with the following pages. the top and bottom numbering of pages doesn't always keep sync. Thanks Ben, this is a known problem. I think the bottom navigation was just added a couple days ago so he's still working on it. Just curious have you had the "license in use" problem at all? We have a fix for it ready, but we've been surprised how few reports there have been. I didn't have any problems with 'license in use' or any other of that kind.